April 23rd is the feast of Sant Jordi (Diada de Sant Jordi), the patron Saint of Catalonia. The local tradition is that the man buys the woman a rose and the woman buys the man a book, although this is not just between lovers, it is also between friends, workmates, … . It is a very colourful day as you will see almost everybody carrying at least one rose. I also, have to say that roses are quite expensive that day. 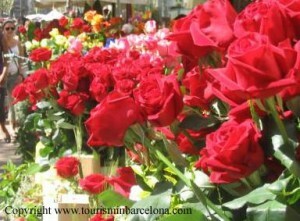 Although Sant Jordi is not a public holiday, city centre, and specially the Ramblas area, is totally packed with people walking around looking for books and roses or simply enjoying the atmosphere. It is also Book’s day (Dia del Llibre) so there are lots of bookstalls where sometimes you can even see writers signing their own books. It is a very romantic day and although in recent years is getting more and more commercial, it is still a very injoyable day. Tip: April 23rd is the only day of the year that the Palau de la Generalitat is open to the public. It is a magnificent building so it is a highly recommended visit. Big queues are expected so try to get there early.